Movie Ramble: Love is Strange. I came across the Memphis born film director Ira Sachs via his second feature film Forty Shades of Blue (2005). The movie starred the beautiful Russian actress Dina Korzun in which she played a trophy wife to Rip Thorns ageing music producer. 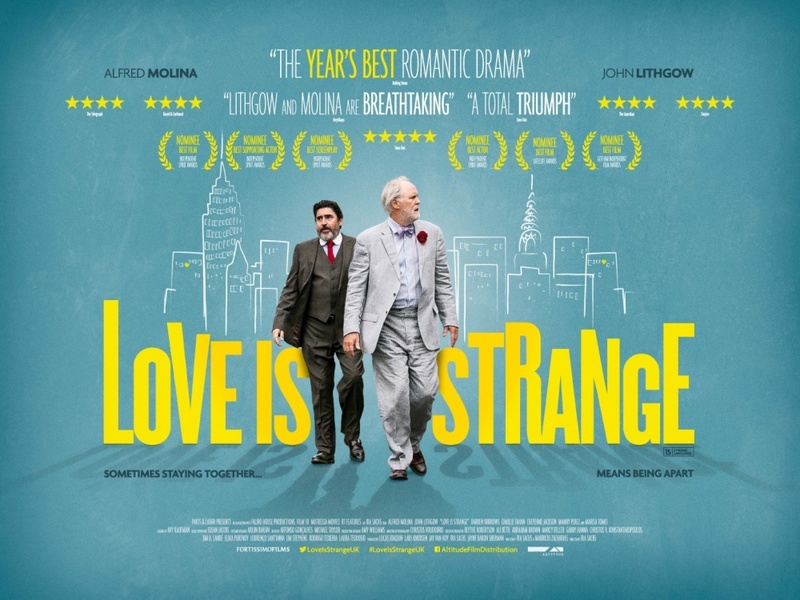 Also featured in this movie was Darren E Burrows who coincidently appears in Sachs latest outing the romantic drama Love is Strange (2014), a character study of a gay couple whose lives are thrown into turmoil when that decide to get married after living together for 39 years. This LGBT movie extends a successful genre to include a love story about two late middle-aged men. 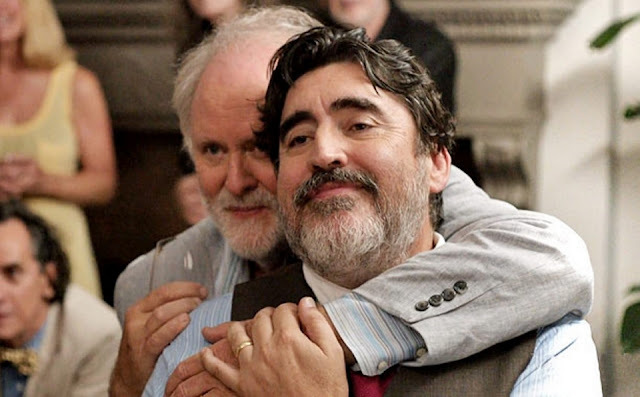 George (Alfred Molina) is sacked by the Catholic school were he has successfully worked for a number of years as a music teacher. His relationship with the 72-year-old Ben (John Lithgow) was well known by the staff, the pupils and their parents, and until they were legally married nothing had ever been said about their relationship. Now the Bishop wants him out after spotting their wedding photo’s on Facebook! Because of this change of circumstances their finances are very stretched and they realise that they will have to sell their Manhattan apartment, as they are unable to afford the mortgage. This leads to a crisis! 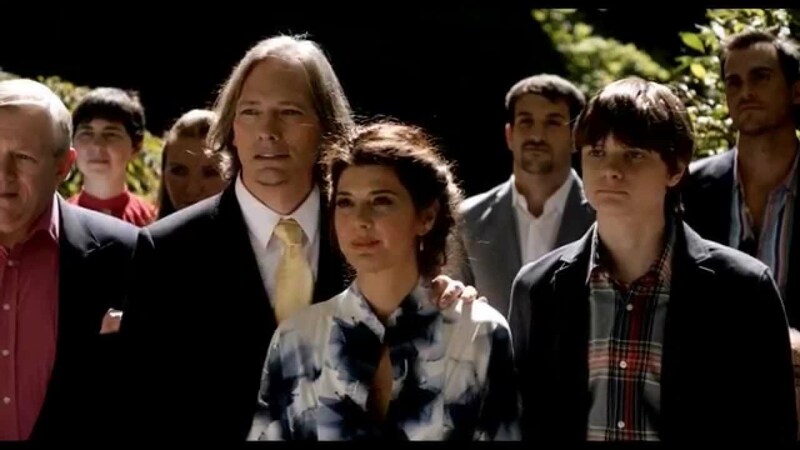 George moves in with his neighbours, two gay policeman who love to party, and Ben stays with his nephew Elliot (Burrows), Elliot's wife Kate (Marisa Tomei) and shares a room with their teenage son Joey (Charlie Tahan), both George and Ben are not happy with this new arrangement as they are forced to live apart. ....while George shares with friends. Sachs, who recently got married to his long-term partner, based many of the films characters on real life people and he portrays the two older middle class Academics as being very much in love and successfully pulls it off. The film has been described as a 'graceful tribute to the beauty of commitment in the face of adversity' and to that I would add meaningful and sincere. It's well written script gives the films cast a chance to excel and with some great cinematography from Christos Voudouris gives a depth to a story that at times is both sad and moving at the same time casting a warm glow over its watching audience who are treated to a rather agreeable love story.